Along with his human partner, Rottweiler police dog Max is ordered to go undercover as a primped show dog in a prestigious dog show to avert a disaster. In the same vein as “classics” like Turner & Hooch and K-9, 2018’s Show Dogs views the bond between canine and human cops. Rottweiler Max (voiced by Chris 'Ludacris' Bridges) stands as one of NYPD’s finest. To investigate animal smuggling, Max finds himself paired with human FBI agent Frank (Will Arnett). They head to Las Vegas to infiltrate a dog show and stop these crimes. Live-action movies with talking animals don’t need to stink, but they usually do. Babe was good, and I liked Paddington. Beyond that, I’m not sure I could find many good entries in this genre. Most films of this sort opt for lame stabs at humor that lack any form of actual cleverness or charm. Though it involves some talented folks, Dogs wastes each and every one of them. Consistently lazy and moronic, the movie fails to generate cinematic entertainment. I suspect those behind Dogs think they’re clever, though. We get a Lego reference for Arnett – to connect to his work as Batman in those movies – and we hear Bridges mutter “this is ludicrous”. These and other “meta” elements feel like nothing more than cheap windowdressing. The components exist to attempt to convince adults in the audience that the movie enjoys some greater depth/wit, but they fail. I understand that Dogs mainly aims for a kiddie audience, and I’m sure they’ll find it more entertaining than I, even if those “adult” jokes will go over their heads. Good family movies find a way to work for kids and parents, so I don’t excuse its lack of intelligence because of its target audience. I’m not so sure how much kids will get from Dogs anyway. The movie attempts a loose narrative but it mainly exists as an excuse for a slew of cheap animal gags and stereotypes, none of which work. Does Show Dogs exist as the worst entry in its participants’ filmographies? Maybe. Inane and witless, the movie never manages to offer even the most rudimentary form of entertainment value. 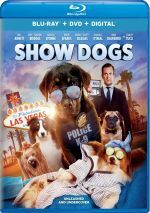 Show Dogs appears in an aspect ratio of approximately 1.85:1 on this Blu-ray Disc. This became a pleasant presentation. Dogs went with a teal-influenced palette that sprinkled in a fair amount of amber as well. Within the movie’s color design, the tones seemed solid. 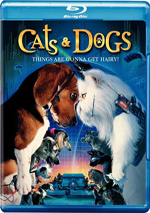 As for the DTS-HD MA 5.1 mix of Dogs, it showed scope typical of the comedy soundfield. This meant a limited soundscape without much to make it stand out from the crowd. A few slapstick/action shots added a bit of immersiveness, as did a few other exteriors, but those instances remained fairly infrequent. Most of the flick came with a lot of musical ambience and not much else. Music seemed warm and punchy, while effects showed nice clarity and accuracy. Again, nothing about the mix impressed, but it suited the story. The disc opens with ads for Mary and the Witch’s Flower, Won’t You Be My Neighbor?, AXL and Spirit: Riding Free. No trailer for Dogs - or any other extras – appears here. Family movies don’t need to offer lowest common denominator fare, but no one told those behind the execrable Show Dogs. Stupid, crass and witless, the film manages not a single clever or amusing moment. The Blu-ray brings good picture and audio but it lacks supplements. Unless you have easily entertained children, skip this stinker.